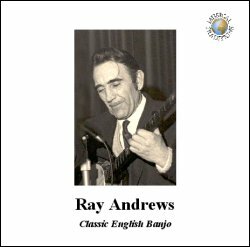 Ray Andrews (1922-1987) was a well-known classic banjo player from the Bristol area. This CD gives us a small insight into his ability, with a selection of tunes that are not often heard these days. In addition, it is interesting to hear him talking about his playing and style on a couple of the tracks, and the accompanying booklet also makes a good read. Some of the recordings are of difficult pieces (e.g. Spanish Romance, Mr Punch and Darktown Dandies) and it is a credit to Andrews' talent that he makes the playing sound so effortless. There are a few lovely tunes here that I was previously unfamiliar with and one of them, Bluebells of Scotland, I shall try to learn myself, as I loved listening to the wonderfully clear harmonics. On the down side, some of the tunes suffer from bad recordings ( in one piece the banjo even sounds out of tune) and it is a shame that Andrews is no longer with us to rectify this himself. The backing percussion on a couple of the tracks is also a little bit too intrusive for my taste, but it does do the required job of accompanying the music. In these politically correct days, you may find some of the titles a little offensive, but it should be remembered that they were written in less enlightened times, so please just enjoy the music for its own sake. You should really enjoy this CD though - it shows how diverse an instrument the banjo can be in the right hands, and it would be good to hear more of this style of playing.